The best harmonizer is that & much more. This pedal includes algorithms from tons of Eventide's legendary & expensive models. You get 100 built-in presets, a tuner, countless other effects to add in, harmonizers, octavers, pitch shifters, synthesizers, & more. There's a lot here that can be a distraction if you want a pure harmonizer, but you will undoubtedly find ways to use most of the effects. The easiest and highest quality pedal for vocalists who want reliability without distraction. Includes three studio-grade reverbs. You get eight harmony options including single & double voicings, as well as the Tone button that's like a mix engineer at your side. The intelligent tracking keeps you in the right key but has to analyze an instrument such as a guitar or keyboard passing through it. EHX's incredible algorithms offer you perfect harmonies, octaves, & pitch shifting. Incredibly easy to use interface & tone. You can shift or harmonize by up to 3 octaves up or down (or both) as well plenty of intervals to select from & even mix them with octaves. The only downside is there's no intelligent key tracking, but that only became an option in recent times. This pedal makes up for it with quality. The best harmonizer pedal will intelligently stack intervals onto your melody strictly in your key, transforming your single-player sound into a beautiful harmony of two guitarists playing in perfect unison. Thicken your tone and become a one-man ensemble with this must-have effect. A lot of us can remember a time where if we wanted to harmonize guitar leads, we'd need two guitarists playing at the same time and hope to the high heavens they can stay in perfect unison. Today, we're far luckier thanks to the invention of pitch-shifting and harmonization effects. One guitarist can shred a lead melody and it can be copied and pitch-shifted to a certain interval or octave and recombined with the original, all in real time. Not only do we get the benefit as individual instrumentalists of having an enhanced sound to draw more attention to our performances, but our band benefits too from the illusion of having an additional band member and a thicker, more enticing soundscape for their songs. Today's smart harmonizers can take input so you can tell it which key you're playing in so you'll always be delivering an extremely pleasing sense of consonance to your listeners. Let's take a look at the features you'll want to make sure are included in your harmonizer as well as the best ways to use it. Then we'll get an overview of our top picks of today's modern lineup of pedals that boast all of the new advancements. What is the Harmonizer Effect? The harmonizer effect is a sub-type of the pitch shift effect, in which the pitch of a sound is lowered or raised. Although this can be any number of cents when using software plugins, pitch shifter pedals transpose notes by specific musical intervals for ease of use. Unlike the older octave pedals, harmonizers can transpose to any number of intervals and not just up or down octaves. This was originally achieved by playing sounds back at different speeds than they were originally recorded, but the effect is no longer tied to time in this fashion. Harmonizers, on the other hand, maintain the original sound and combine it with a pitch-shifted version. For instance, if you set your pedal to harmonize at a major third interval the duplicated sound will be shifted up four semitones. Today's "smart harmonizers" can accept the key you're playing in as an input in order to make sure your harmonies are always consonant. The result is a pleasing stacking of melodies that play in perfect time together, serving to thicken your tone and the soundscape of the song in general. What to Look for in a Harmonizer Pedal? The assumption here is that you're looking for a harmonizer for your guitar, keyboard, or other instrument, as opposed to one for vocals. Vocal harmonizers include a lot more features not directly applicable to your instrument and their prices can go through the roof. Knowing the difference can save you a lot of grief. In the current playing field, the main feature I suggest you make sure you have is key tracking. As mentioned above, old harmonizers weren't "smart" like the new ones are, meaning they'd take your directions too literally and often play out of tune. There's nothing worse than a dissonant note popping out where it shouldn't be. It's the exact way listeners who don't know music theory try to identify amateurs. Smart harmonizers can accept a key as an input and understand that when you tell it to harmonize at a specific interval that it should still only use notes in the key. This feature is a must. Imagine the headaches (and expertise!) of players who used to be able to dance around these issues during their improvised solos, etc. The first key aspect in using a harmonizer is to place it in the correct spot in your guitar pedal signal path. The reason for this will become clear in a moment. Harmony is a type of pitch shifting and comes very close to the front of the signal chain, only after compression and equalization, essentially. You want to shape your waveform before duplicating it for harmony so you get the cleanest and clearest version being duplicated. But you want it before effects like chorus, delay, and reverb so you aren't feeding other pedals overly complex signals nor butchering your clean sound. For instance, you wouldn't harmonize a delayed signal, you would delay a harmonized signal. These days with smart harmonizers that can lock into key for you (a great, must-have feature in modern pedals), you'll often see pedals with tiny LCD screens or a series of LED lights helping you navigate through various options. Those will differ from pedal to pedal but largely help you choose which key to lock into as well as which voicing to harmonize. Others take care of this with knobs. Let's look at the general knobs that are similar across all options. The most important knob you'll see is often called Harmony or Type. These both let you choose which voicing to use, often labeled as high, higher, low, lower, octaves, unison, etc. Many have a built-in Reverb knob to let you dial that in if you don't have a dedicated unit. But the other important knob is Level, which lets you define how loud the harmonized line is in comparison to your lead. You'll often see this labeled as Blend, Mix, or Balance. Many allow you to save presets too, which you'll find buttons for. Another common option, like reverb, is the Tone knob to control the brightness of the outputted signal. And of course, whether through a knob or a screen, you'll find the Key option to select which musical key you're playing in so your harmonized lines are always consonant and pleasing to the ear. Now that we've covered which features to keep an eye out for and how to use harmonizer pedals in general, it's time to get a bird's eye view of the marketplace to see what the best choices are for our precious money. We don't order these in any special way, but we do draw attention to our favorite pick as well as point out two other "best in class" options in the comparison table at the top of the article. Take the time to consider each, because if they made the list then they exceeded our expectations. Our "Best Budget Pick" goes to the Electro-Harmonix Pitch Fork, which also doubles as our "Best Bang for the Buck" pick for guitarists (our vocalist pick is below). For the instrumentalist, you won't find an easier pedal to use. You set your Blend level between your dry signal and your harmonized signal, and then you choose the intervals you want to use. It's dead simple. Polyphonic harmonization has never been so easy, but note that this is not an intelligent harmonizer, meaning there's no way to input which key you're in. That's not a big deal seeing how that's a relatively new feature. We got by fine without it, though it is sweet to have. The tracking and accuracy of this pedal makes me not care though, it's a worthy trade off. There's a couple more features to mention though. The switch in the middle lets you choose between a harmony below, above, or having both at the same time. The Latch button moves the footswitch from Latch mode to Momentary mode, the second of which lets you harmonize momentarily (like the length of the chorus) by holding the switch down. When you let it up the effect turns off. When in Latch mode, the optional expression pedal controls the pitch (making this a harmonizer pedal as well as a pitch shift pedal), and in Momentary mode you can control the glissando rate instead. That defaults to 60 milliseconds but you can move it to 4 ms up to 2 seconds. The Shift knob is where the magic happens. The numbers 1, 2, and 3 in black circles are for the number of octaves you want to add in (making this an octaver pedal too!). The 'D' setting is for Detune mode which will thicken your tone by pitch shifting down 17 cents. Otherwise, and the reason we're here, are the other settings on the Shift knob that let you select the intervals you want to use. You can choose from a minor and major 2nd, major 3rd, perfect 4th, perfect 5th, major 6th, and minor 7th. Dual mode even lets you mix and match these intervals with octaves. You can do a lot with this very easily. Like Eventide says, the Eventide Harmonizer PitchFactor is a "multi-voice intelligent harmonizer from the company that invented it!" This beast is filled with ten algorithms for the ultimate in pitch shifting and harmonization, most taken from their most coveted pedals and effects, like the H910, Quadravox, Crystals, and more. It even comes with a "HarPeggiator" that creates arpeggios based on your playing with a bunch of rhythm patterns and fuzz effects to choose from and the Synthonizer to convert any instrument into a unique synthesizer. There's even an app for your smart phone, tablet, or laptop to control all the parameters. Going through all of it will be impossible, but let me hit the highlights. You get 100 built-in presets and can add an unlimited number more through the MIDI connection, as well as save your own. You get a built-in tuner. You can change everything in real-time by tweaking the knobs or using a MIDI or expression pedal. There's a tap tempo button and a MIDI clock sync so all of your various effects play in time. It has true bypass, metal footswitches, and a very rugged metal chassis. You get line level inputs and outputs for instruments, in either mono or stereo. There's tons of professional music acts using this pedal, from St. Vincent and Steve Vai to Deadmau5 and Katy Perry. The reason for that is Eventide are the originators and continue to be the masters. You're not only getting a killer harmonizer but access to an absurd amount of other effects that you'll definitely find a way to use. You're getting an octaver, pitch shifter, delays, reverbs, detune, whammy, and just countless amounts of other effects to stack on top of your harmonies. The way the harmonies work is you'll dial in a key and a scale (you don't see that on other pedals! ), and then you can choose your intervals with one or two extra voicings (or four with Quadrovox). This is all knob selectable and displayed on the LED screen. You can even hold down the "Learn" knob and strum a chord to tell it which key to use and it'll tell you what it's reading so you can confirm before you start. It's incredibly fast and accurate. This is the best harmonizer pedal out there. If you're a professional and want no compromises, then this is what you need. For the vocalist in a band or a one-man show, no harmonizer is easier to use than the TC Helicon Harmony Singer 2. Forget "smart harmonizers" and having to constantly change which key you're in. The Harmony Singer tracks whatever instrument you plug in, whether that's guitar, bass, or keyboard, and that's it. Now you're always in key, you can set the mix levels of your vocals compared to the instrument yourself, and even tack on one of three types of studio-grade reverb. Those are room, club, and hall, each of longer length. But back to the harmonies. Notice the Harmony knob and the eight styles you can select. They don't have names due to the changing keys, but they're essentially "above, more above, below, and more below." By mixing and matching those, you get all eight of the settings. They're your classic 3rds and 5ths, basically, but with a catch. Let me tell you, this thing sounds amazing because it's not locked in and static. It's following the instrument, so you get some very interesting harmonization choices being made for you that sound far more classy and musical than most of the boring options you have out there that spit out the same thing each time. When you plug your mic into the sweet preamp, there's an automatic input gain setter that gets you in the ballpark compared to the volume of the instrument (which is just passing through dry and being analyzed for the right key) and then you can tweak to taste with the Level knob. From there, you can pop the harmonies in and out at will with the foot switch, to really supercharge your choruses or last verses to take the song out in style. Perhaps my favorite feature on this pedal is the Tone button. When you press that sucker, you immediately get a noise gate, de-esser, subtle equalization, and compression added. It's like having a mix engineer in a button. If you're a vocalist and don't want a ton of complexity, just want the harmonization job done well and easily, this is what you want. No doubt about it. It's our "Best Bang for the Buck" pick! Another solid option for the solo vocalist that plays along with a guitar or in a band, the Boss VE-2 Vocal Harmonist is a complete effects box that can easily enhance your performances with minimal effort. You can even use it to record vocals to your computer. Like the 'Harmony Singer' above, this one features what Boss is calling "Auto-Harmony," meaning the pedal can latch onto the chords being played by your guitar to always detect which key you're in. Even if you change on the fly during a bridge, it'll know and adjust your harmonies immediately. You can also set the key manually with the dedicated knob for those times you're performing acapella. There's even a hybrid mode so if the rhythm guitar turns into lead or rips a solo, you're still in good shape. You get quite the number of harmony options here, totaling 24 comprised of 12 up and 12 down variations of single and double voice harmonies. You select these using the Type knob that provides you with a visual confirmation of what is selected by lighting up easy-to-see red LEDs. Like others, you can dial in some reverb, delay, or both. You can set your own vocal levels and the balance between your lead vocal and the harmonies. There's also a subtle pitch correction that can be applied to your vocals if you prefer that support, thanks to the Enhance button. Press it once and you add in some compression, EQ, and noise gating. Press it again and you add in auto-tune. Whatever settings you create and enjoy, you can save them as one of three presets to be recalled at any time. This is a great, high-quality option with a very easy to use interface. Like the 'Harmony Singer' above, the TC Helicon VoiceTone Harmony G-XT model follows their same design philosophy. 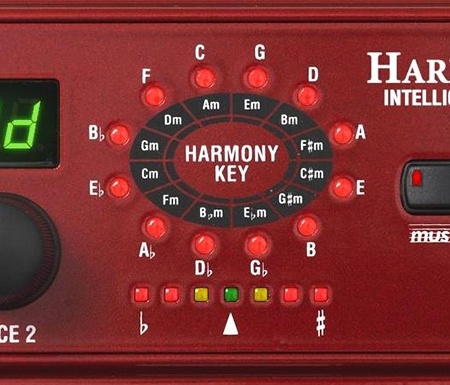 Instead of being an "intelligent harmonizer" in the sense that you select a key on a knob, this one also listens in on a guitar, keyboard, or any other instrument to know what key you're in before harmonizing with your vocals. This is so much better than having to constantly change the knobs. You can set it manually if you're a vocalist without an instrument, but it's not on a knob. You have to navigate to the option using the LED readout. This is a vocal effects processor, focused mainly on the vocalist and supported by the instrumentalist (or yourself if you're playing along). Most don't need to change much at all thanks to being able to quickly cycle through the pre-loaded presets that each have an A and B effect, while you can also save your own custom ones as well. Besides the one and two extra voices of harmony set at a 3rd, 5th, or octave (all above or below) plus a neat "bass interval" that follows the root note of your instrument, you get a lot of other built-in effects such as an array of reverbs, a delay, a vocal doubling effect, and some modulation. It even has a built-in tuner for your guitar. What's nice about this for a singer-songwriter is it's kind of like an engineer in a box. You can adjust the volume of your guitar or keyboard independently from the microphone, which runs through a low noise preamplifier. But there's a Tone button that, when engaged, adds a de-esser, compressor, a noise gate, and even some EQ to sweeten your voice. It also has an Auto-Chromatic Pitch Correction feature so even if you flub a note you'll slowly get corrected back into key. From there you can slap on a reverb or delay and you're done, all without intervention from the crappy sound guy. Consider this one as the bigger, more involved brother to the TC Helicon Harmony Singer above, with a lot more options. The guitarist or bassist can get so much mileage out of the Boss PS-6 Harmonist stompbox. It comes packed with four modes including Harmony, Pitch Shifter, Detune, and Super Bend. You can build up to a three voice harmony while syncing into the correct key thanks to the Key selector knob. You can also pitch shift like a whammy and detune all voices, while the Super Bend provides up to four octaves for extreme pitch bending and dive bombs. It also has an expression pedal input and stereo outputs. Housed in the classic Boss casing that's nearly indestructible, this bad boy packs in quite the number of options. The Balance knob controls your mix levels between the dry and wet signals but also acts as a rise time controller when in S-Bend mode. The Shift knob controls your pitch shifting intervals but at the extremes turns into a voice harmony selector. The Key knob has all of the keys laid out chromatically for easy switching between songs, and also acts as a fall time controller in S-Bend mode. Note the Mode knob, which has you choose between major and minor for the harmony keys, and otherwise has the three other modes ready for selection. Detune mode can alter the input signal by up to +/- 20 cents, though hanging in the 10 cent range sounds much better. The pitch shifting ranges from 3rds, 5ths, 7ths, and single or double octaves. Of course, we're here for the harmonizer aspect, and there's no noticeable latency and the tracking is spot on. With these "smart harmonizers" you need to make sure your guitar is perfectly in tune at A-440 though, otherwise the "intelligent" aspect of it goes right out the window. Your harmonization choices are a 3rd, 5th, 6th, octave, 3rd & 5th, 3rd & -4th, -3rd & -6th, -octave, -4th & -6th, and octaves above and below. Pretty much every interval you could need in the high-quality we've all come to expect from Boss. Note that the harmonization is not polyphonic, but the pitch shifting is. If you're harmonizing, this is for lead guitarists only. When you hunt for a harmonizer, you need to ask yourself if you're looking for one primarily as a vocalist or a guitarist or other type of instrumentalist. They basically come in those two types. Their goal is to create a pitch shifted version of your original signal to the interval of your choice and recombine them, allowing you to blend the levels to taste. For the convenience of our readers we've included options for both types above in our list of the current best harmonizer pedals on the market.